Whether you have been living in your home for awhile or you are preparing to buy a new home, it is important to stay aware of potential signs of wood destroying pests. 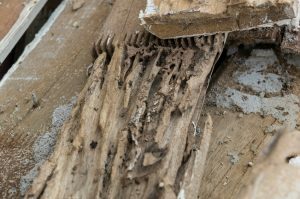 Termites are a common problem in California, and in other areas of the country there are ants, beetles, and other unwanted “critters” that can wreak havoc on your house and surrounding structures. Luckily, a few proactive steps can go a long way to protect the quality of your home and reduce the likelihood of damage. Anywhere there is wood in your home, take a moment to inspect the area visually. You might notice dry rot or decay. If so, even if the problem seems small, it is essential that you take action right away. By calling a pest control expert sooner rather than later, you can eliminate the problem before it turns into a full-blown infestation. A pest inspection is highly recommended before you close the sale on any new home. Often, inspections are required by the lender but even if it is not a requirement, that pre-closing inspection could save you a ton of expense and stress down the road. As the buyer, you have the opportunity to inspect the property for potential problems or repairs that are needed. If the inspector finds signs of a pest infestation, then it is essential to identify the severity of the problem before you close on the property. You can negotiate with the buyer regarding the cost of eradication, or you might choose to back out of the contract if the problem is severe. If you have any questions or concerns regarding this issue, just let me know. I’d be happy to refer you to a professional in your local area.